The menu prices at Easy As Cake, a café and bakery in Colchester, end in the number nine. A baby quiche is $3.99; a Greek salad, $7.99; pesto and tomato popover, $8.99, grilled cheese sandwich, $6.49, French toast bake, $5.99. As I played with food and money combos in my mind, the counter person (and daughter of the owner) waited patiently. When at last I’d nailed down my choice to a hand pie — a house specialty — she steered me to spinach-artichoke ($6.99). I paired this with a bowl of Cuban black bean soup ($4.99) to clock in at $11.98, not including tax. The soup was thick and rich with flavor, blended to a consistency of part purée, part chunky. It had a spicy snap — cumin, cayenne, chili powder — but also earthiness. 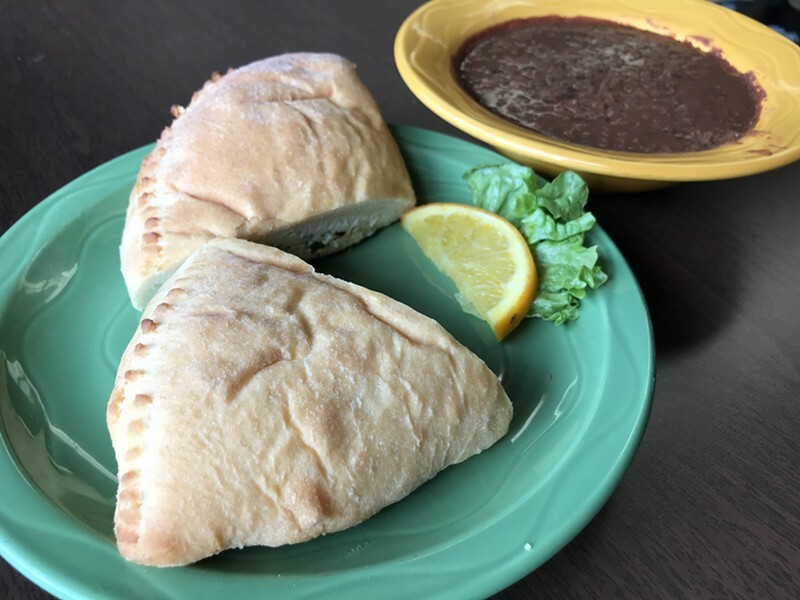 A hand pie at this sweet little café goes by its central European name: kolache for a sweet one filled with traditional ingredients such as poppy seed, pecan or apricot-prune; klobasnek for a savory pie stuffed with kielbasa, Philly cheesesteak or spinach-artichoke. Either way, a hand pie is characterized by a sweet and buttery pastry. The vegetable spread in my klobasnek was more accompaniment than equal player. The afternoon last week when I ate lunch (near closing time) at Easy as Cake, I was the only customer in the restaurant. This got me a window table and a chance to talk with chef/co-owner Jeff Goller. Goller and his wife, Nicole, opened Easy as Cake in December in the spot that most recently housed Malletts Bay Diner & Bakery. Jeff is a landscape architect and cook; his kolache recipe comes from his grandmother, who emigrated from Slovakia at age 16. Nicole is a baker and cake decorator who also owns a quilt and sewing shop in Colchester called Sunny Laurel Sisters. 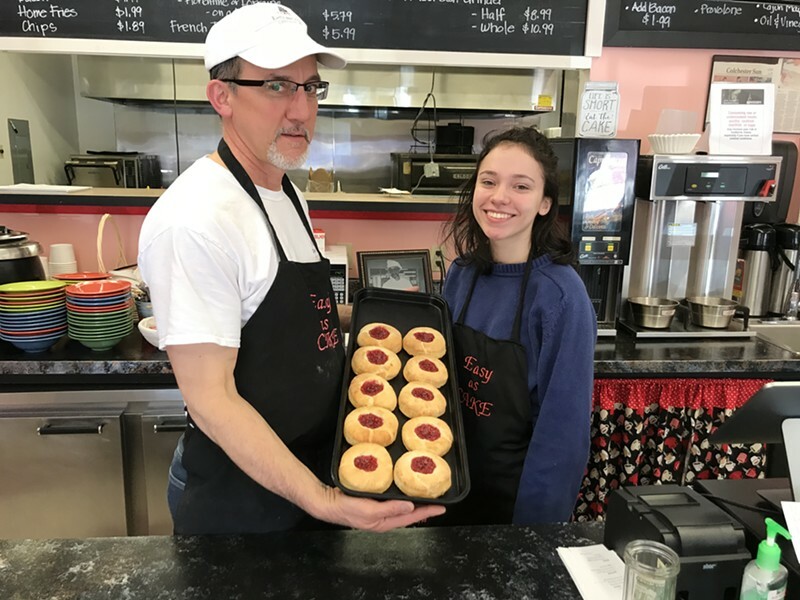 Opening a bakery and restaurant was a kind of natural progression for the Gollers: Jeff knew his way around kitchens “backward and forward" as the son of a professional (his father was chef at Amherst College) and a pro himself who’s worked in restaurants off and on for years. "It's in my blood," he said. In addition, the Gollers had built a little business baking cakes for people in their home kitchen — a gig that developed after they made their own wedding cake for their September 2018 marriage. Jeff baked the tiered layers; Nicole decorated it with colorful bursts of flowers. “We merged all our talents,” Jeff said. The pastry case at Easy as Cake displays those merged talents. The left side holds hand pies made by Jeff; Nicole’s side of the case holds sweets including lemon-glazed donuts, whoopie pies, chocolate chip brownies, blueberry muffins and macaroons. I hit my $12 limit before I had a chance at dessert. But Easy as Cake was offering free samples of chocolate-caramel brownies the day I ate there, so I happily helped myself to a few of these chewy delights. Dining on a Dime is a weekly series featuring well-made, filling bites (something substantial enough to qualify as a small meal or better) for $12 or less. Know of a tasty dish we should feature? Drop us a line: food@sevendaysvt.com.